Please note: vehicles are NOT included with this playset. 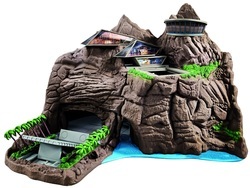 Recreate your own International Rescue adventures with this amazing Tracy Island Playset. Based on the top secret headquarters, Tracy Island uses the latest technology which allows the vehicles to interact with the island. Put on the International Rescue Communicator and take command of the Thunderbird fleet! Flick the switch and the palm trees will move back to make way for Thunderbird 2. Then lift up the ramp and prepare for launch! Lock and load Thunderbird 1, pull back the sliding pool and watch the dock automatically rise up through the push of a button. Load Thunderbird 3 into the launch silo and press the button to launch the rocket into space. Launches are accompanied with the iconic 5,4,3,2,1 countdown. FAB! ﻿We love this playset, having had fond memories of the Blue Peter build it yourself version from years back! It's easy to assemble and with over 40 actions and sounds, will be perfect for any Thunderbirds fan. However, please be aware that the playset does not come with the iconic Thunderbirds vehicles. Most people who buy the Tracy Island playset on Amazon also buy the Thunderbirds Vehicle Super Set, which gives you all four Thunderbirds for around £30 and is compatible with the Island playset. Decal Sheet and Instruction Sheet. ﻿﻿Adult assembly required. Please read the instructions before use. It is advisable that you apply the decals on the section of the island BEFORE you assemble the island as this will be much easier. Look out for the step by step assembly video for a guide on how to assemble and how to play with Tracy Island.